Try when getting "Runtime error 339 - component COMCTL32.OCX not currently registered; file is missing or invalid" error message. 2. Right-click on cmd and select "Run as Administrator". 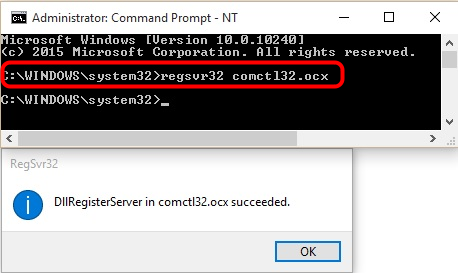 If successful you should get a pop-up saying "DllregisterServer in comscl32.ocx succeeded"
4. Run TC2000 version 7 to see if this resolved the issue. If you still get the same error message, please follow the directions in the following article to backup your settings and re-istall TC2000 v7.